fwknop stands for the "FireWall KNock OPerator", and implements an authorization scheme called Single Packet Authorization (SPA). This method of authorization is based around a default-drop packet filter (fwknop supports iptables and firewalld on Linux, ipfw on FreeBSD and Mac OS X, and PF on OpenBSD) and libpcap. SPA requires only a single encrypted packet in order to communicate various pieces of information including desired access through a firewall policy and/or complete commands to execute on the target system. By using a firewall to maintain a "default drop" stance, the main application of fwknop is to protect services such as OpenSSH with an additional layer of security in order to make the exploitation of vulnerabilities (both 0-day and unpatched code) much more difficult. With fwknop deployed, anyone using nmap to look for SSHD can't even tell that it is listening - it makes no difference if they want to run a password cracker against SSHD or even if they have a 0-day exploit. The fwknop client runs on Linux, Mac OS X, *BSD, and Windows (under Cygwin). There is also a separate Windows UI with source code available here. In addition, there is a port of the client to both the iPhone and Android phones. Replay attacks are detected and thwarted by SHA-256 digest comparison of valid incoming SPA packets. SHA-1 and MD5 are also supported, but SHA-256 is the default. SPA packets are passively sniffed from the wire via libpcap. The fwknop server can also acquire packet data from a file that is written to by a separate Ethernet sniffer (such as with "tcpdump -w <file>"), or from the iptables ULOG pcap writer. fwknop is open source software released under the GPL (v2), and full source code can be viewed/cloned here via github. For iptables firewalls, ACCEPT rules added by fwknop are added and deleted (after a configurable timeout) from custom iptables chains so that fwknop does not interfere with any existing iptables policy. 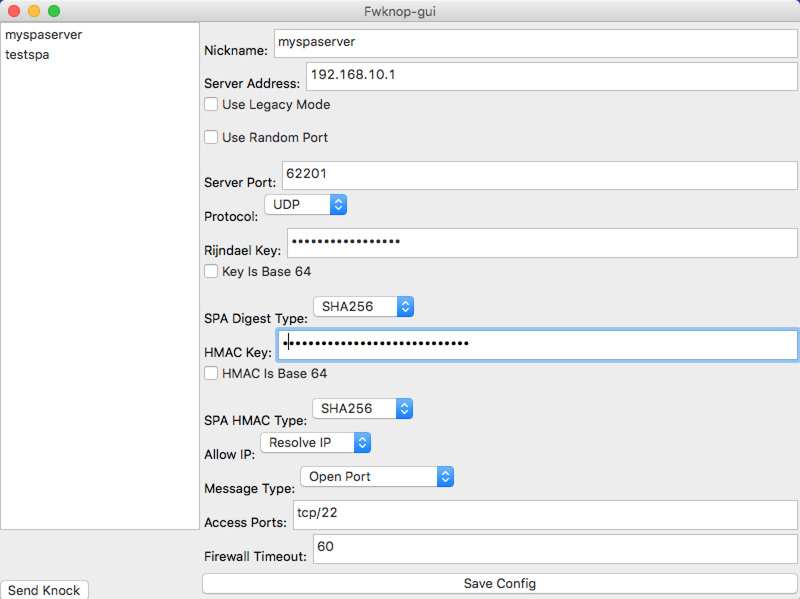 Supports inbound NAT connections for authenticated SPA communications (iptables firewalls only for now). This means that fwknop can be configured to create DNAT rules so that you can reach a service (such as SSH) running on an internal system on an RFC 1918 IP address from the open Internet. Automatic resolution of external IP address via http://www.cipherdyne.org/cgi-bin/myip (this is useful when the fwknop client is run from behind a NAT device). Because the external IP address is encrypted within each SPA packet in this mode, Man-in-the-Middle (MITM) attacks where an inline device intercepts an SPA packet and only forwards it from a different IP in an effort to gain access are thwarted. Integration with Tor. Note that because Tor uses TCP for transport, sending SPA packets through the Tor network requires that each SPA packet is sent over an established TCP connection, so technically this breaks the "single" aspect of "Single Packet Authorization". However, Tor provides anonymity benefits that can easily outweigh this consideration in some deployments. The fwknop server can be configured to place multiple restrictions on inbound SPA packets beyond those enforced by encryption keys and replay attack detection. Namely, packet age, source IP address, remote user, access to requested ports, filtering regular expressions against commands, and more.